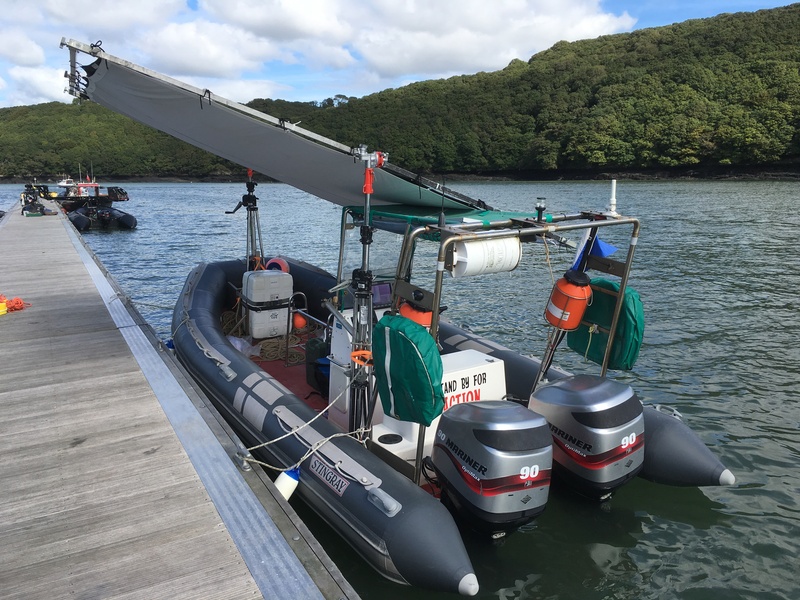 Stingray is kept at Mylor Yacht Harbour, here is some information on both Mylor and Stingray. Mylor Yacht Harbour is situated just outside Falmouth, TR11 5UF, within the Carrick Roads (the Fal river estuary). 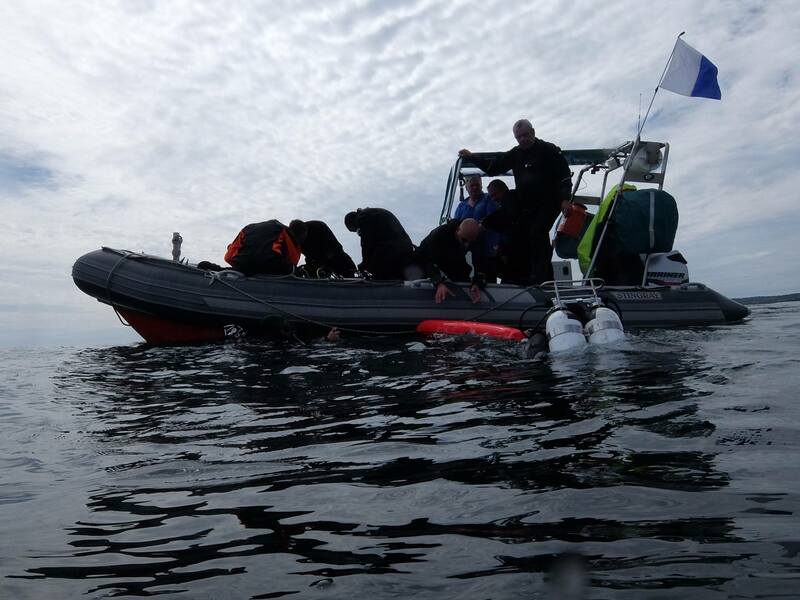 It has many facilities that makes it a great place for a base for a dive boat. There is plenty of parking available, within two small car parks close to the marina and at either side of the half mile long valley (boat lay-up area). There are public toilets as well as the rather smart, harbour customer’s toilet and shower block. Outside the harbour toilet block, there is a warm water kit wash.
Cafe Mylor has some excellent food, they are used to people in wetsuits going in to order food, we usually sit outside though, with a view over the harbour. Castaways is a very good, quality restaurant. 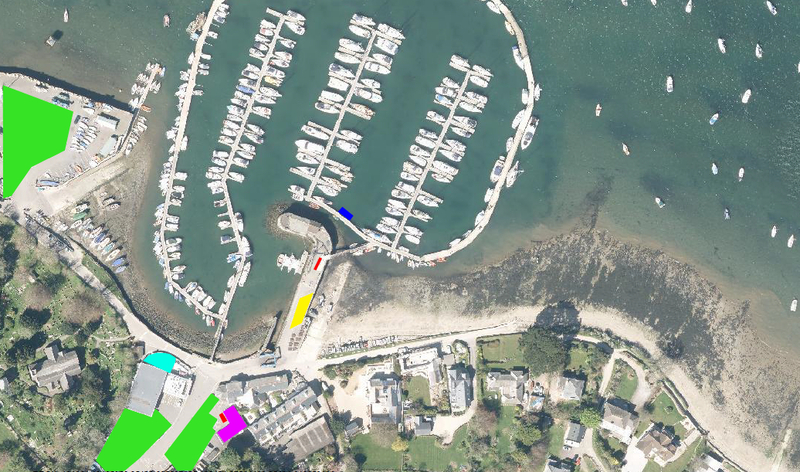 Below is an aerial photo of Mylor Yacht Harbour (courtesy of the Channel Coastal Observatory), various features are coloured, see the legend below. Where will the boat be? The boat will be situated at the blue marked area on the aerial photograph above. It will arrive between 60-30 minutes before R.O. time. R.O. stands for Ropes Off, the time the boat plans to leave the quayside. So get there beforehand, an hour before works well, to get your kit ready and on the boat before that time. How do you get back on the boat? We are a very social group, if we are at Mylor around lunchtime, we have lunch at the cafe. On a two dive day, we stop at the cafe between dives. After mid afternoon dives, we usually stop for a drink and a piece of cake. It is also a good Scuba diving school dive boat, for Cornwall anyway.